I’ve been getting a number of requests for different bread recipes and I thought it might be easiest if I rolled them all into one recipe. Three different styles of bread from one standard dough mixture – really, it’s as easy as that. Once you get the basics down, you can start improving and personalizing your own style and brand of bread. Experiment with different ratios of whole-wheat to white flour, different shapes and sizes, … practice makes perfect – there’s nothing else to it. I like to make Kokun with plain regular white flour and for Yu-shang or Logo-Momo, I mix some whole wheat with regular white flour. If you like sweet Kokun bread, then add some sweetened condense milk when making the dough – this softens the bread and also give it sweetness. Others say one should add 2/3 Tablespoons of yogurt to the dough to have softer bhaley but my family prefers the harder, chewier bread, so no condense milk or yogurt in our bread! But you should out different ways and see what you and your family like. Place all the ingredients in a large bowl. Make a well in the center and add the water little by little, mixing it into the flour, until you have one big lump of dough. 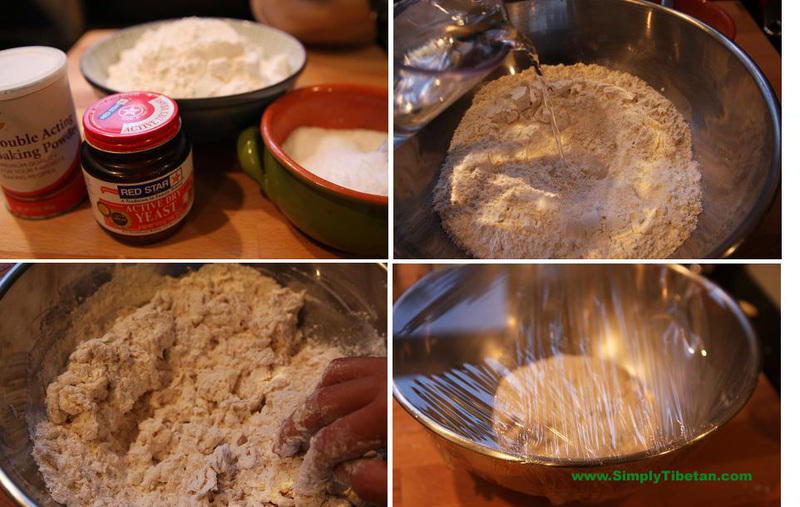 Stop adding any more water and continue kneading until the dough is firm and smooth. 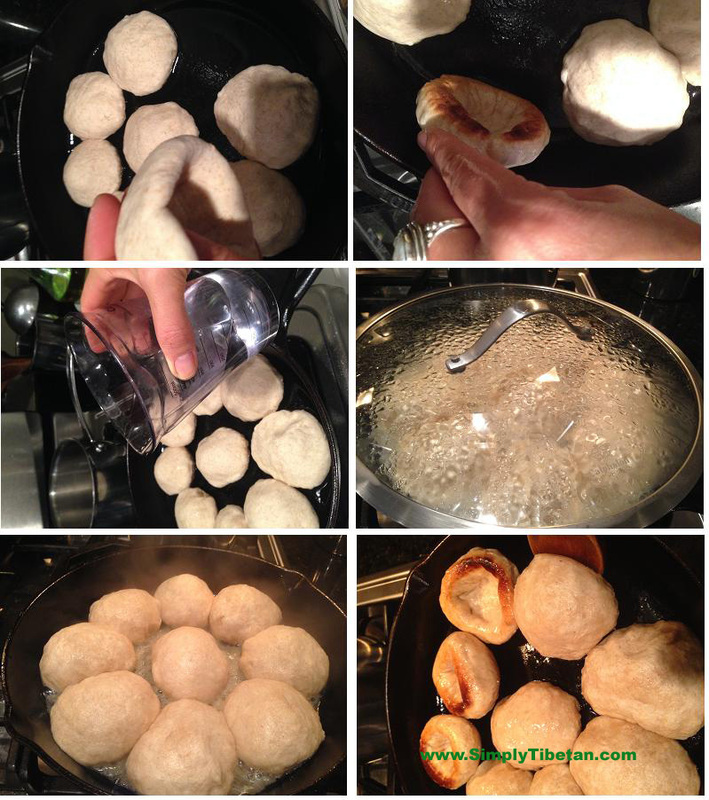 Place the dough ball in a lightly oiled bowl, cover with a clean kitchen towel or cling wrap and allow to rise for 30 minutes or up to few hours (use less yeast if you are going to leave it overnight or longer than 2 hours). Place the rolled bread on a hot griddle. Its important to keep the griddle at a medium-low heat setting – with practice you’ll figure what’s best for your type of griddle and stove. But if its too hot, it’ll burn and if its not warm enough, then it’ll just take way too long. Cook on one side till little bubbles form, then flip it over and let the other side cook. It will start puffing up slightly, then turn over and let both sides brown nicely. I don’t know why I don’t make Yushang bhaley more often. Its so good. When I think of Yu-shang bhaley, I think of picnics. Growing up in TCV school, over summer holidays, we would go on overnight picnic trips to Kangra river, Triund, or Ri-Nyi-Gyab-Chu (BehindTwoMountainsRiver) .. and our picnic grub would be Yu-shang Bhaley & Shogog Khatsa. Tired from all the swimming, walking, … the slightly oily, giant size Yushang Bhaley, churned out in the hundreds from the TCV common kitchen and little serving of Shogog Khatsa with it, is a taste that still lingers in my mouth. Here’s a little guide for you to make them for your family. 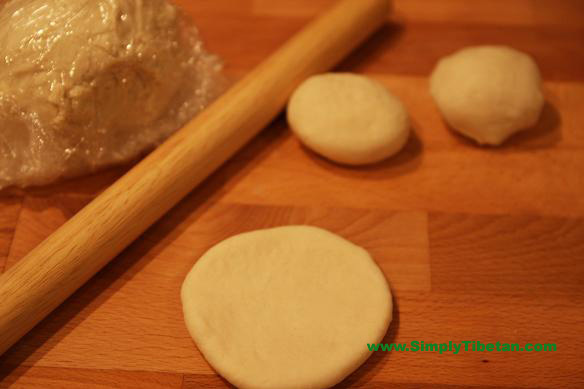 Take one round dough ball, flatten it with you palm, and roll it flat with a rolling pin into a 6-7 inche flat round shape. 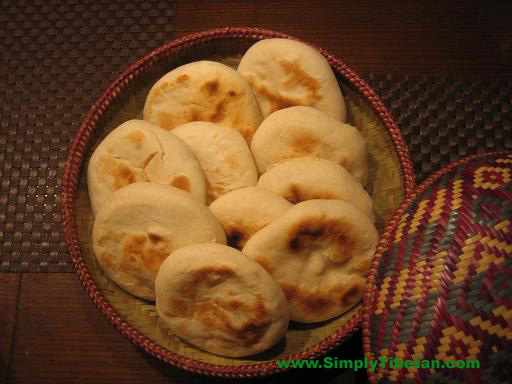 (If the dough sticks to the rolling surface – a sprinkle of flour on the surface will help.) 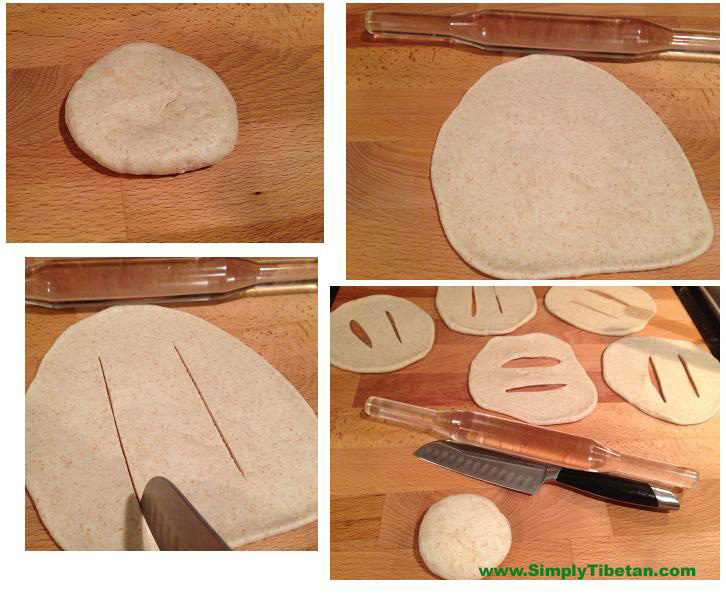 With a sharp knife, make one or two 3-4 inche straight cuts in the center of the flat dough. This lets the dough expand and cook evenly. In a large skillet, heat about ½ cup of oil – covering the base of the skillet. 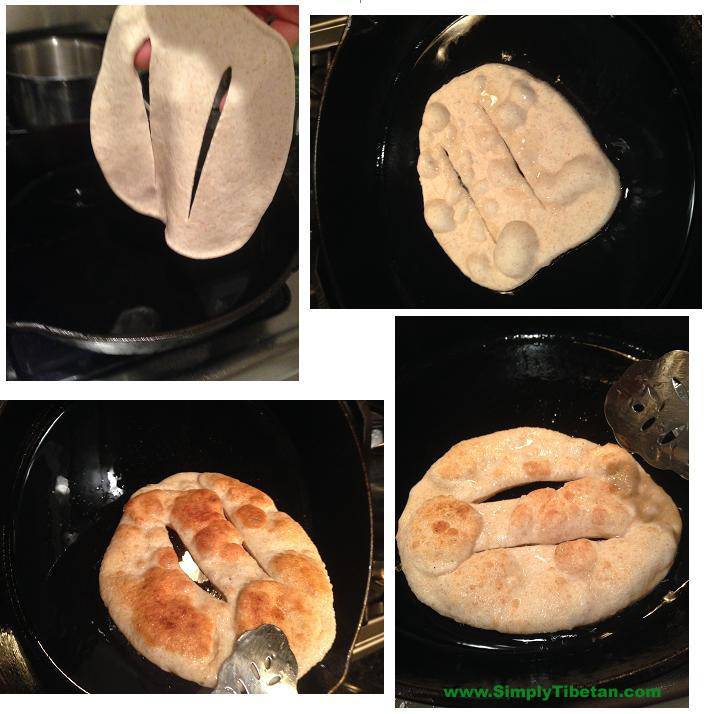 Slowly lower the flat bread into the skillet. Once it forms bubbles, flip it over and let the other side cook. Cook each side until nicely golden brown. The bread gets done very quickly so keep a watchful eye. Add more oil to the skillet as needed. Logo-momo is a hearty and unique bread. As a child I was never too fond of it but now I love its texture and simplicity. You really don’t need much of anything for this bread – and its so quick and easy to make. I have an aunt who used to make this for me when I visited her sometimes. She lived by herself near the Kora in Dharamsala, in a small one room apartment with a small kitchen on one side of the room with a single small stove. She would cook the meat and vegetables first in the pan and then push them to the side to make room to cook the logo-momo on the side, in the same pan. It was delicious. After the meal, she would take out her snuff and her infamous handkerchief – and then conversation would begin and I would be treated to all the gossip and the wonderful tales and stories of days bygone – she had an incredible memory and a real knack for telling stories and I never did mind hearing them again and again. Divide the dough into pieces slightly bigger than golf balls. Take one dough piece and shape it with both your hands into an igloo shape. Use your two thumbs to push in the middle and your other fingers to hold the igloo shape. Heat the skillet, add 2 Tablespoons of oil and let it cover the entire surface of the skillet. 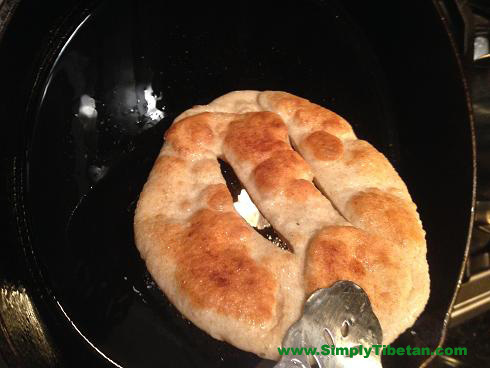 Place your igloo shaped bread on the hot skillet and let the bottom surface get to nice golden brown. At this point, take a cup of hot water, add it to the skillet and cover it up. Let it cook until most of the water has evaporated. Now, take of the cover, turn down the flame and let the rest of the water evaporate completely. Once its evaporated, your bread is done. 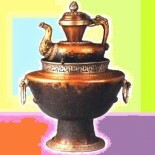 I’m going to try it tomorrow for our Losar Lunch along with Sepen and other Tibetan dishes. I also made Chaang…which turned out good and sweet. BTW my husband is half Tibetan, I’m not. to make the dough of logo momo is baking soda required or not? Yes, you can put all the ingredients in a large bowl, add spoonful oil, mix slightly and start adding water to make into dough. in your recipe you listed 1 tbs of vegetable oil,then in the dough preparation you said mix all the ingredients together. does that mean that the vegetable oil is mixed along with the dry ingredients before you pour water in it? thanks. 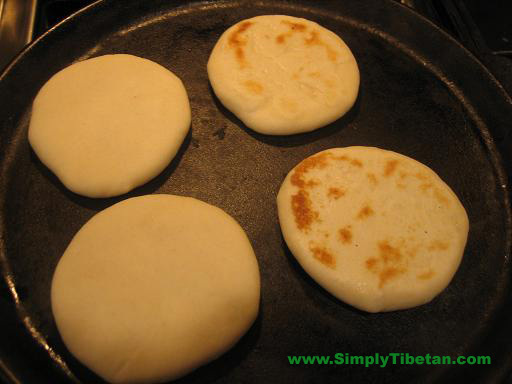 This entry was posted on October 28, 2013 by simplytibetan in Recipes and tagged bhaley, fried bread, kokun, logo momo, tibetan bread, yu-shang.